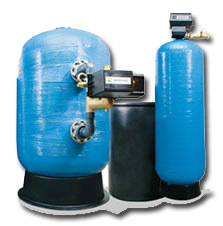 Spring Brook Supply offers a full line of water treatment equipment ranging from small residential water softeners to large commercial water treatment applications. We are able to treat high hardness, high iron, raise pH and remove hydrogen sulfide with the Sanitizer series conditioner. The Sanitizer utilizes Zeolite, a Chlorine Generator (which makes chlorine) and Min Plus to treat problem waters. Water-Right manufactures and sells one of the broadest lines of residential water treatment products available today. From whole-house solutions to point-of-use systems, we have the technology and expertise to solve almost any problem water challenge. Which solution is right for your household? Take a look at these residential products. You’ll learn more about our unique medias and patented solutions. Then contact one of our factory-trained dealers who can help test your water and specify the ideal product for your specific situation. A self-sanitizing system that does more in a single pass, including removal of hardness, iron and manganese also adjusts pH, and kills iron bacteria with every regeneration. Three unique models designed to handle a wide variety of hard water problems … for any household need. Used in combination with other Water-Right systems to treat individual, and extreme problem water, such as acidic water, chlorine, iron, sulfur, unpleasant tastes and odors, and more. Providing the best quality water for drinking and cooking by removal of unwanted contaminants such as nitrates, lead, arsenic, cysts, and more..
Crystal-Right silica crystals are a natural choice for today’s water conditioning systems. No other media does so much to condition problem water in a single pass. Often called “zeolite” crystals, this media comes from a sodium aluminosilicate formula that is produced and processed by Mineral-Right using an exclusive technology. Through its unique crystalline structure, Crystal-Right™ provides superior removal of hardness, iron and manganese, while at the same time, raising pH levels of acidic water. Water-Right uses two types of Crystal-Right media, each with slightly different softening characteristics. Water-Right’s Heavy Commercial Series water conditioners are engineered to be highly effective in commercial applications requiring 60,000 to 600,000 grains of softening capacity and flow rates to 107 GPM per tank. These systems provide excellent removal of hardness, iron, and manganese, along with pH correction. The HC Series solid brass controller can be expanded to multiple tank configurations for applications requiring continuous soft water or higher flow rates. Chlorine generators are available on most Water-Right commercial water conditioners to provide self-sanitizing operation during each regeneration. This exclusive feature creates free, dissolved chlorine using the system’s brine solution. During backwashing the chlorine serves to eliminate iron and sulfur bacteria that can reside and grow in most media beds. Available only on Crystal-Right™ media systems. Call our commercial application specialists or more details.